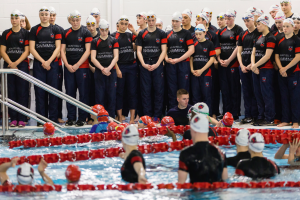 A new Olympic Legacy 50m swimming pool at a private boarding school in Devon has been officially opened by HRH The Princess Royal. The pool at Mount Kelly in Tavistock was built in partnership with Sport England through National Lottery funding. HRH The Princess Royal was treated to a swimming display by local primary school children and members of the Mount Kelly swim squad before unveiling a commemorative plaque.